South-Texas based Apache Pistol is bringing alternative English indie arena rock to the Rio Grande Valley through a unique method. “Distance and Moments,” their first full-length album, was largely recorded remotely as members of the band live apart from each other. Consider that each of the five members have day jobs — with at least two working from as far Houston, for instance — forcing them to collaborate via the internet to record. Coming together was clearly a much simpler task. Guitarist and vocalist Frank Cardona came up with the band’s name. He met and was inspired by a fellow named Apache Revolver and suggested it to the band. They loved it, he said, and the rest is history. Dusty Salas, bassist for the group, views it as a perfect representation for the way he and the band operate as “different key points,” he said. “We are all different parts of the weapon that when we come together we form that unique multi-weapon as the band,” Salas said. One thing they do share in common, as lead singer Joey Castillo pointed out, is their affinity for wearing denim jackets. The members began to hone their skills near their teen years. The band began with Cardona and guitarist Orlando “Roly” Martinez. The two are childhood friends who began making music together. Soon, Castillo was added, followed by drummer Charlie Alem then Salas — who took a bit of a chase. 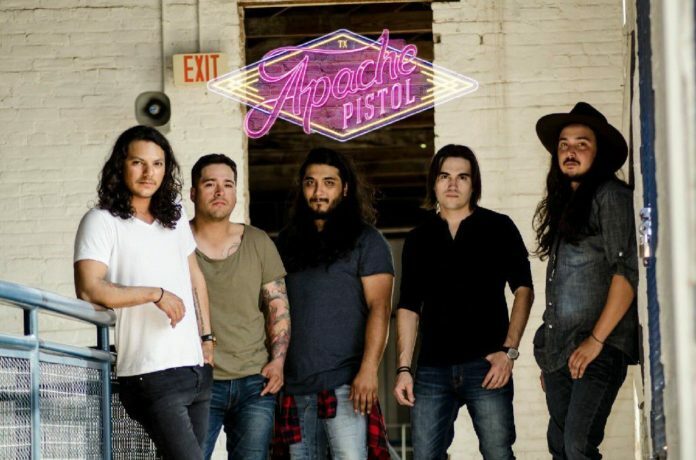 The members of Apache Pistol best describe their relationship with one another like that of stepbrothers. An album release party will be held at 8:30 p.m. Saturday, Dec. 30 at Cine el Rey. The show is a red carpet event, “so make sure to dress to impress,” Salas said. They had the opportunity of performing at the historical theatre earlier this year for the Somos Musica Fest, which celebrates artists from the Rio Grande Valley and Mexico. A videographer was on-hand during practice to shoot footage for their documentary. No release date is yet set. Their efforts are being appreciated. The band has a Facebook page it uses to post new music and keep fans updated. “Love Her,” an original song the band released back in April, has gained thousands of views within a week. Many of the tracks hold a personal meaning. The songwriting process can branch from any idea. “Whatever moves me,” said Castillo. Apache Pistol pools concepts or storylines to create a song, which can take anywhere from a day to a month. The members also connect from their experience as fathers — all but Alem that is. One of their songs, “Motherbird,” was written about their kids, watching them grow and allowing them to form their own identity. “That song is about how you don’t expect them to follow what you do … be yourself, live your life. Whatever you do, ‘Te voy a apoyar,’” Cardona said. Pre-sale tickets are out now and can be purchased at Roosevelt’s at 7. A presale ticket acts also as a raffle ticket for an acoustic guitar — along with a tuner, strap and case. The night before, Friday, Roosevelt’s at 7 will be giving away 50 free CDs to customers who purchase an “official Apache Pistol beer,” selected by each of the members. Weekend Warrior, a Texas owned and operated shop, will participate in another raffle to give away a clothing bundle.